for a designer meal before or after some elegant snoozing here is... and we love it because those lovely ladies, Fifi & Ally are so sure of their own style. And then translate it into mouth watering menus that never fail to impress. ... so do you want to know what's keeping those 'in-the-know' folks talking about Carlton George Hotel? It's... those truly breath taking views from the rooftop restaurant. What a surprise! Of course, the impressive views are matched by the quality of the service and the fantastic meals served in Carlton George Hotel. Enjoy! Now... don't tell anyone else. And DO NOT reveal this Carlton George Hotel top secret file and password. We'll know.... And we'll track you down and pour custard in your shoes! And get yourself onto the VIP list below while it's still open, and I'll drop you a short email every time we reveal something new about Carlton George Hotel. And remember you can grab your own page here to share your tips, photos and stories about Carlton George Hotel. Have fun! Great news! Finding this page means you can now join our VIP list for Carlton George Hotel. You found the Top Secret File for Carlton George Hotel. If you don't have a password yet, there are still lots of great things about Carlton George Hotel in its Buzz Page. ("The Buzz" page is also the place to pick-up the password by taking part). underground Buchanan Street in the hood! overground Glasgow Queen Street in the hood! 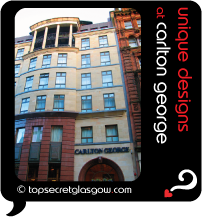 Carlton George Hotel Glasgow has 24 hour front desk service.